The VIMED® TEKORA by MEYTEC provides a professional space solution for implementation of the demanding medical audio, video as well as image communication. The solution is flexible and it can be adapted to the specific requirements of the medical team. The VIMED® TEKORA solution is a hardware and software combination of multimedia communication, audio and video communication, medical imaging and data documentation or visualizations of various kind combined with an intelligent management system. The solution can support, in a particularly effective way, the interdisciplinary cooperation of physicians located in territorially remote hospitals and other medical facilities by the providing of diagnostic and therapeutic collaboration. 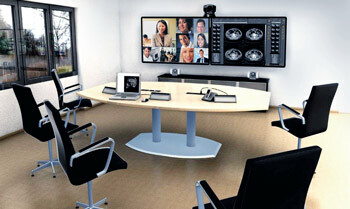 There are different versions of VIMED® TEKORA, ranging from simple solutions to the large telepresence solutions.